The worldwide knitting community has bonds of yarn ( of course), patterns, yarn festivals, Ravelry, and finally–the knitalongs or KALs in knitting language. There are sewalongs and crochetalongs, but they do not fill me with yearning and emptiness the way KALs do. KALs are planned and introduced by different websites and designers.. They have their rules, Instagram handles, Ravelry groups and prizes. Knitters get down to knitting their chosen project, exchange notes and ideas, help and encourage each other, and generally have a good time. By the end of a KAL, the prize becomes immaterial when one has a neat, coveted, finished project. Currently, there are some big KALs in progress. . Fruityknitting has a Lace andCable KAL in progress, Fringeassociation is doing a Steekalong, and MasonDixon have just begun my personal favourite KAL, the February Bang Out a Sweater. Every year, a pattern is chosen well in advance, yarn choices are discussed and shared, and on 1st February, the KAL begins. Last year, a zillion Carbeth sweaters emerged, and before that, it was a Fair Isle Hadley pullover which flooded the Internet. I was planning to take part in this KAL this year, but alas, the chosen pattern of cables just did not appeal to me. I have recently completed a cabled sweater, and I wanted to knit something simple but smart, in thick wool. A cardigan, which could be thrown over anything, seemed to be the right project. Since this KAL ( technically, it has the opposite meaning), is just for me, I feel a trifle foolish, writing about this, here, on the blog. 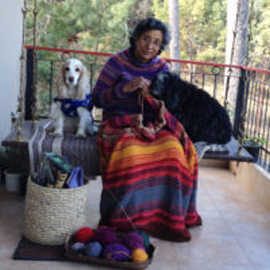 But then, I know there are readers here who cannot or will not be able to knit right now..Tropical country, family and work pressures, no support network of knitters, poor health–so many reasons for not being able to knit some love and joy into a garment. They will understand when I roll my eyes and wonder what made me take on a darkish shade of purple to knit up this cardigan. The finished cardigan will NEVER look anything but a shaggy hand-me-down from a polar bear. It will always have dog hair sticking to it, and only the discerning few will be able to identify the knitting pattern. And those readers will go back to the beginning, read my proclamation that I do not want to knit cables, check the photograph and see a big fat cable, and agree with me that life ( and knitting) rarely follows a straight line. I am knitting this lovely pattern from another amazing designer and blogger, Thea Coleman. It has just two cables, an easy garter ribbed body, and I should be racing along. I had visions of knitting up a 100 gm ball every two days, but life, dogs and knitters sort of dropped in to make all such plans vanish. I am going to keep you updated about this project, but I need to remove a thousand dog hairs first!